Adventuring into a world of darkness in order to discover the worlds of heat and light! It's been an exciting time on the homeschooling front for us. 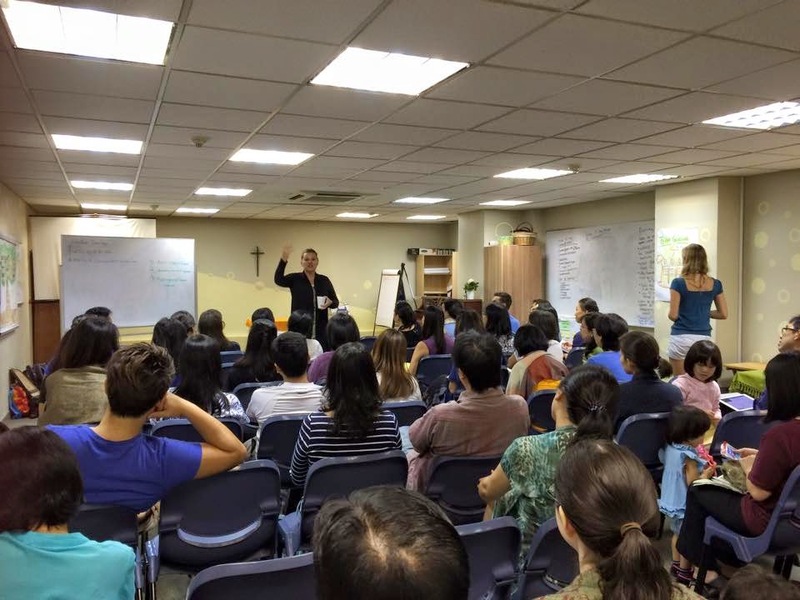 Mark and I attended our first homeschooling conference right here in Singapore, with at least 50 other homeschool parents and their kids. The guest speaker Heather Shirley is one of the CEOs of Classical Conversations, Inc., based in the US. It's a curriculum that our family has decided to embark on starting August this year, as a community with 6 other families. We can't wait! The Classical Conversations Parent Practicum was more than what we thought it would be about. More than just covering the curriculum, it dealt with the much bigger picture of the core of education and what learning is all about. It dealt with the heart issues of us parents, and how we are often more like slave masters or sledge hammers, drilling Science and Math concepts into the brains of our children, rather than gently wooing them with an appreciation of the beauty behind these disciplines and how everything we study reflects the awesomeness of the Creator. The Classical Conversations Parent Practicum which took place last week. 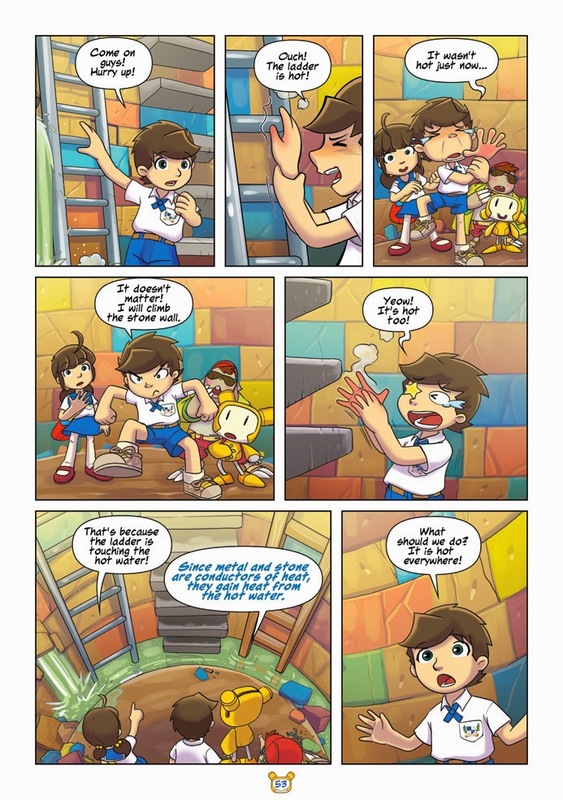 Reading Aurelia Tan's second book in the JJ's Science Adventures series reminded me of the whole discussion. I had earlier reviewed the first book on Magnets and had really enjoyed what I had earlier thought to be a dry, boring Science topic. I was looking forward to this second book, covering two topics this time, Heat and Light. Aurelia once again draws her young (and not so young!) 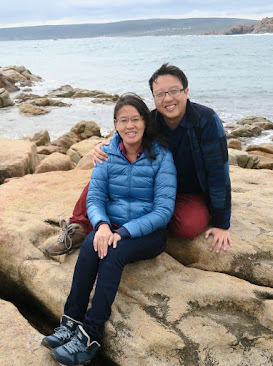 readers into the world of Professor Tan, inventor of the 'World Maker', a machine able to create worlds in different dimensions, and the adventures of his two grandchildren Jonathon and Joyce, whom he has designed it for. 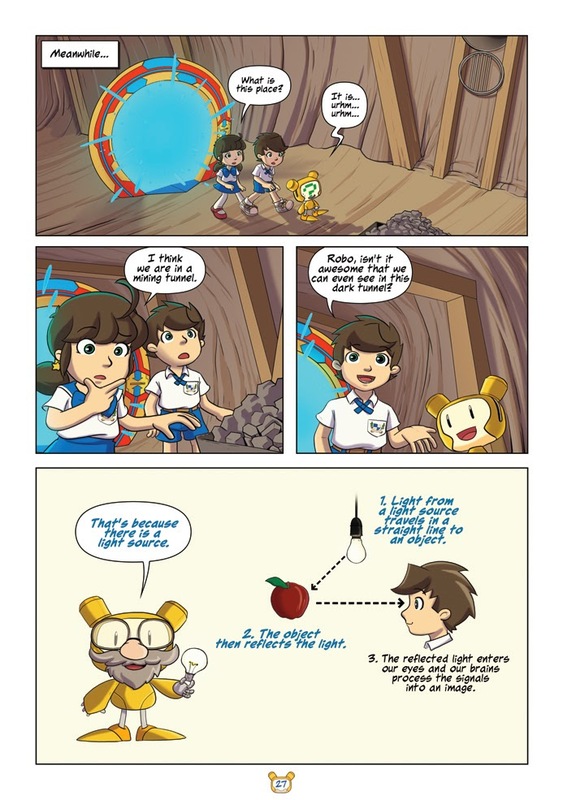 The comic definitely woos readers with it's engaging plot, extremely creative plot, and illustrations which transport the reader into a subterranean world of darkness where they save a community of mole coal miners from overheating due to the sun staying still in the sky. 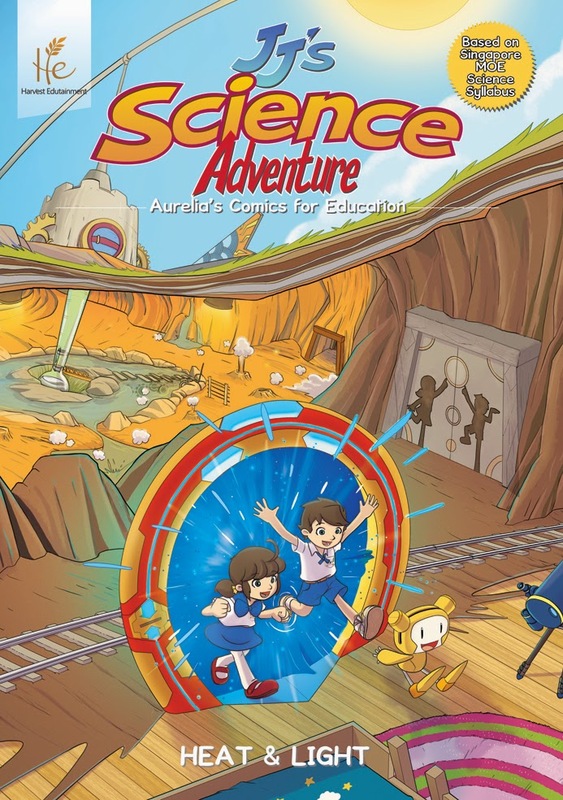 It is fascinating to me how Aurelia is able to weave the Science concepts (with the key words required in the MOE Science syllabus, no less!) so seamlessly into what is an extremely imaginative plot, with illustrations by award-winning illustrator Nicholas Liem working so closely in tandem to draw children into a world of darkness where heat and light are the keys to the puzzles they solve and the problems they encounter. Using Scicnce concepts to solve a puzzling predicament! I would say it takes much more skill for an author to take a concept like 'the law of reflection' and incorporate it into a narrative plot than to write a chapter in a textbook on a similar topic. The best teachers are those who can take a complex topic and make it simple and easy to understand. Why is it that we can still see in the dark? Because of the reflected light which enters our eyes. Learning about how shadows are created. Learning never occurs in a vacuum, but is always best done in context. At the conference, I realised why I had such struggles with Maths and Science when I was in school. I could never draw connections between what I was reading in the textbooks and how it would be relevant to my everyday life. As Heather Shirley shared at the conference, I was suffering from what she termed as "intellectual disconnect". We were never meant to study subjects in isolation; in the real world, Science is intrinsically linked with Geopolitics, and Maths with Art. In the early years of what we know as the institution of education, subjects were all interconnected and people learned from studying the greats like Aristotle and Plato, and not by reading summaries from textbooks. Textbooks came about because of the industrialisation of education into what we now know it to be; schools as factories producing workers for various fields in the economy. But what, you may ask, does this have to do with the role I feel a comic series like this one may have in Science? I would think that a much more effective way of helping a child to understand a concept would be to show him or her how it works in real life, the uses it has in solving the challenges we face, and having the chance to experiment for ourselves to see if what he or she is learning makes sense. So, this is why we need to know about conductors and insulators of heat! I would also want to use a medium that would woo the child into wanting to find out more, rather than something that bores him or her into thinking that the subject is dull and only something to be learned for the exams. I learned during the Parent Practicum that often indirect learning works best. We toss an idea at our child, and see if he or she is ready to pick it up, examine it more closely and decide if it's something worth pursuing. 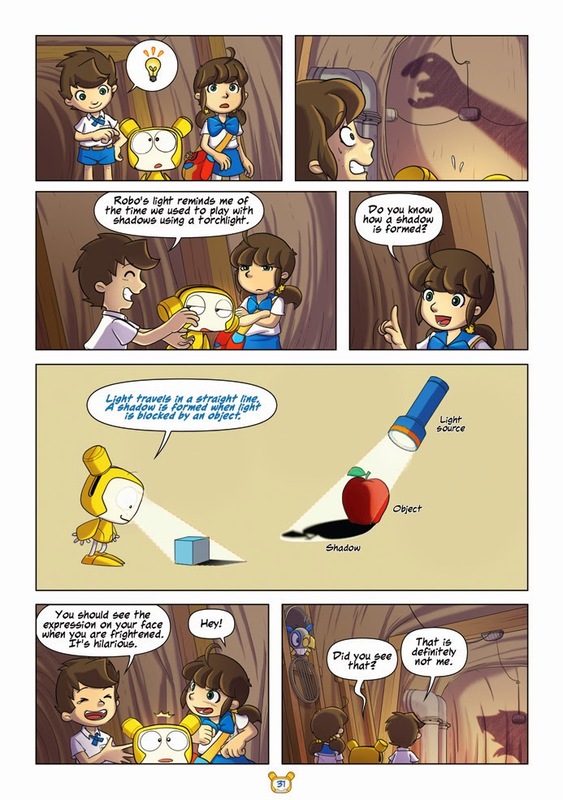 I feel that JJ's Science Adventure series does this well. This volume is well worth the price as it combines two topics into one, and even comes with a DIY sheet which children can use to experiment with the concept of what factors contribute to making a shadow larger or smaller: the distance of the object from the light source and from the screen. To assuage parents' worry that their kids are not going to cover the syllabus which they will need to know for the exams, it is stated that the key words they will need to know are featured in bold, and there is even a series of topical tests that have been included to check for understanding, as well as a Did You Know? section which links to further topics for exploration. 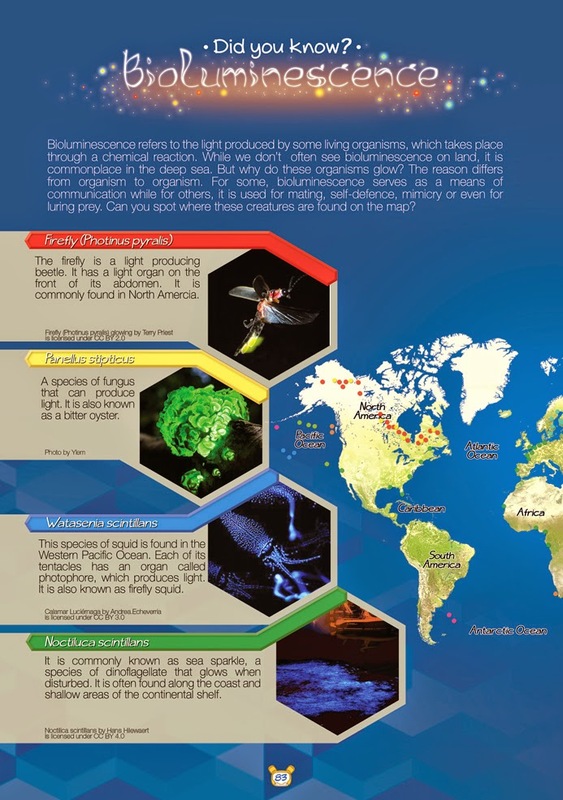 On the fascinating subject of Bioluminiscence. 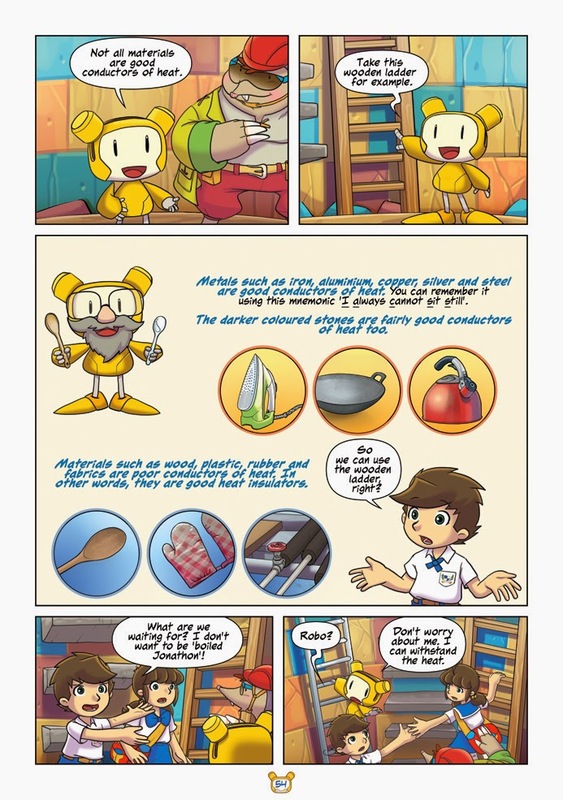 Kids can read up further if they are interested. You can purchase the book from this link.